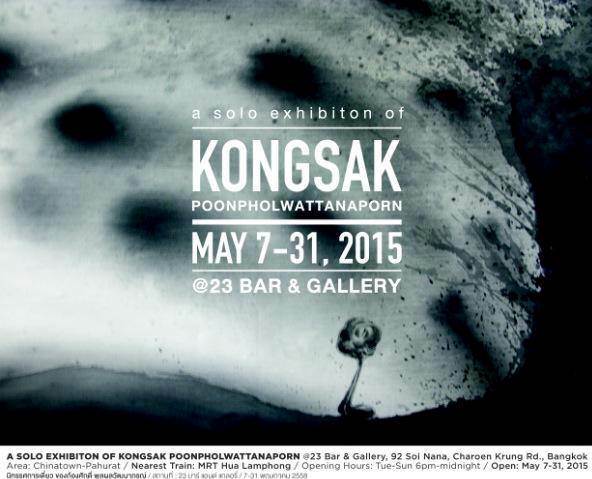 23bar & gallery is very happy to host our first art exhibition, a solo exhibition by Kongsak Poonpholwattanaporn. At the time when I was working at my office it’s very hard time of my life. I think it’s because the serious of time and I don’t like it’s that make me feel contrast myself. I though about that at 2 years and that time I try to find myself. Then I quit my job and start to make paintings. I’m very interesting about water. When I saw the water flow I feel that the same of human life. Life it’s must to flow to everywhere that be. I’m try to design my painting the new image of water with happiness, fun, bright and cute that the same of my character. I want to sent my feeling into my painting. So I design the eye of water like a clock hand it’s mean the time of life to flow with happiness. At last I’m strongly hope everyone who saw my work is got a happiness time and enjoy them life. Kongsak Poonpholwattanaporn is a contemporary Thai artist whose works have traveled extensively, particularly in Australia. He is a painter, sculptor, and feasts with fiberglass. Very sensitive to the modern world, his paintings are an ode to figurative art, graffiti, collage, and mixed materials. The characters he draws seem straight out of a new universe of comics.